Relax in this charmingly restored antique home during your summer vacation. Linger on the wrap around porch in early evenings with a cone from the local ice cream shop. Close to award winning golf, Shining Sea Bike Path, shopping and dining. Only 6/10 of a mile to the wonderful Megansett Beach, ball field, library and charming village shopping. This home is sprawling with over 3,000 square feet of living space that includes; 4 bedrooms, 2 full baths, 1st floor laundry room, beautiful kitchen with great entertaining space, lovely dining room seating for 8, comfortable living room, wrap around covered porch and a bright large sunroom with a sofa bed (extra charge for additional guests). The basement is finished, has TV/games and with plenty of room for the kids . This home is graced with many extras - beautifully appointed rooms, a stone fireplace in the living room, central air conditioning and a rolling green lawn on .67 acres. Laundry room is on the first floor and has iron and ironing board. My family and I rented the house for a family wedding. It was a perfect house all around!!! We all had our favorite part of the house, the yard, the porch swing, the basement set-up, the outdoor shower and the sun porch. The house was great for our weekend trip with some extended family. It has all the amenities needed and was very clean and comfortable. Plenty of room to roam in the side yard and great central location to beach and Falmouth center. Thank you so much for taking time out of your day to write this thoughtful review. It is warming to know that your family was able to enjoy a wonderful weekend together on the Cape and that the house lended itself to adding some great memories for you. Thank you for choosing our Cape house. This spacious Megansett property was well situated and appointed. The floor plan provided a very comfortable social and sleeping atmosphere. I want to buy this house - it's perfect! We were coming to the Cape for a wedding and needed a place to stay for a week. We were lucky enough to find this spectacular home. There were six of us, plus various guests in and out throughout the week. More than enough room for everyone. We could all find a special place for some "alone" time too. The location in North Falmouth was perfect - a little quieter than some of the more touristy areas. The house was clean and the yard was gorgeous. Don't miss the outside shower. We would love to stay here again in the future. I should add that there were a total of three homes that guests had booked for their stay during the week - this was, by far, the nicest! The charming seaside village of Falmouth Massachusetts was first settled in 1660 and incorporated in 1686. The cultural resources, historical significance and New England charm can be found all about this lovely town. From over 75 miles of coastline to the historic charm of downtown Falmouth Village, one may find an abundance of activities the whole family will enjoy. Only 6/10 of a mile to Megansett Beach on the Bay side of the Upper Cape. Glistening waters, soft white sand and plenty of fun for the kids at this beach. The Megansett community and it's charm is what Cape Cod dreams are made of. 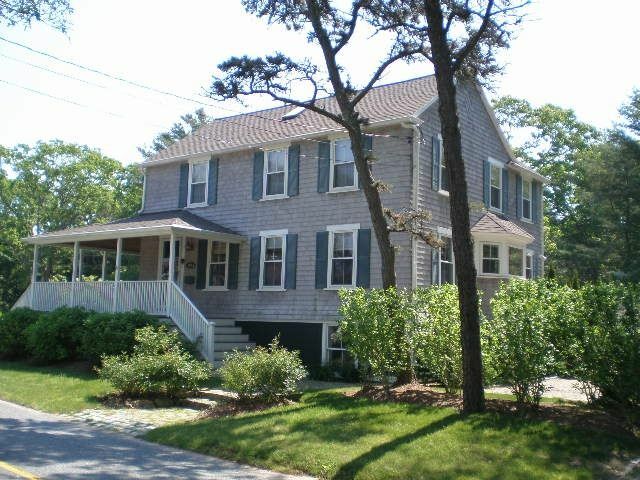 Close to the North Falmouth ball field, playground and the Library... for those not so 'beachy Cape Cod days'. Escape to the Cape and relax. Vacationers book with confidence. Scammers target rental sites such as this. We do not offer discounts for full payment in advance or ask that money be wired to our bank. If you receive an email asking for funds to be wired to a bank, be suspicious. Our rental agent is a licensed MA real estate and will reply by phone and email.